I've got new products in store today! 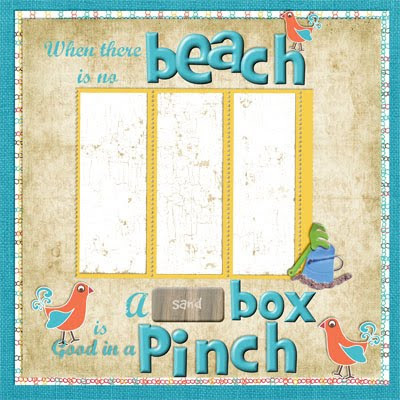 First, I'm releasing Beach Fun in my Digi Scrapbook Mania and Digi Scraps Drive In stores today! Perfect for all of you holiday + vacation photos! This kit is jam packed full of goodies! Today only - you can pick up this entire kit for just $2! Today is the last day of my huge holiday sale! All sales end at midnight tonight! Check my blog all week for free QPs and cluster frames! Today is also the start of CT Appreciation Week. I'd like to brag about Cindi today - it's her birthday too! Cherry Garcia or French Silk, but a good Vanilla Bean will make my day! Which kit of mine is your favorite? Why you do digi scrapping? Digiscrapping helps me get my scrapbooking "fix" without having to drag out all my paper scrapping stuff all the time. Plus, I love UNDO!!!! Go on - leave her some love! And now for your freebie - a QP from Deanna - isn't it fantastic? Don't forget - today's the LAST day for my sales! And everyone who makes a purchase at my stores will be entered to win gift certificates! I'll announce the winners tomorrow! Thank you so much for this post. I want to let you know that I posted a link to your blog in CBH Digital Scrapbooking Freebies, under the Beach/Sea/Fish, Boat, Sail, Water etc. Theme post on Jul. 06, 2010. Thanks again.